Reminder: There will be a public meeting to discuss the Stillwater River Road closure at the Nye Fire Hall on Thursday, July 30 at 6:30pm. All three Stillwater County Commissioners are expected to be in attendance. The Stillwater County Commissioners released two documents to the Billings Gazette yesterday that they will be presenting at the meeting. 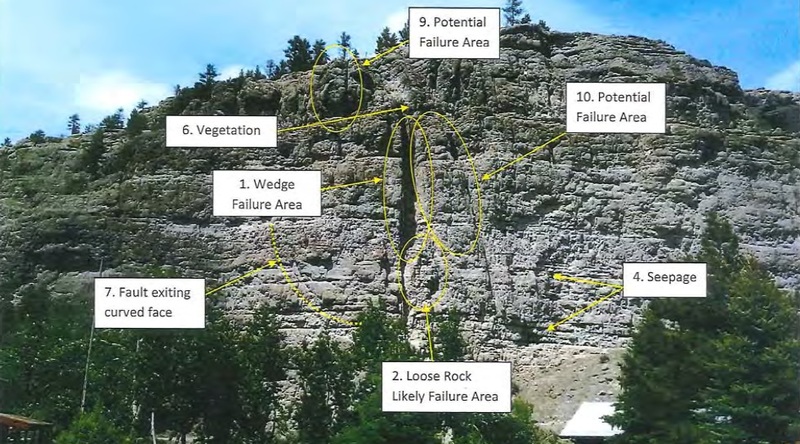 These include a “geotechnical reconnaissance” and risk assessment prepared by SK Geotechnical of Billings and received by the County Commissioners on June 15, and a preliminary proposal for rockfall remediation by Geostabilization International (GSI) of Grand Junction, CO, dated July 13. The two documents were prepared for Great West Engineering of Billings, which presumably is being considered as the contractor for the project. The two documents have been combined into one, and are a total of eight pages. I strongly recommend you read them if you are going to the meeting. You can download them by clicking on the graphic at right. “Numerous areas…appear to be unstable. In the vicinity of label 2 (see photos below), several suitcase-sized rocks were observed which appeared to be relatively loose. 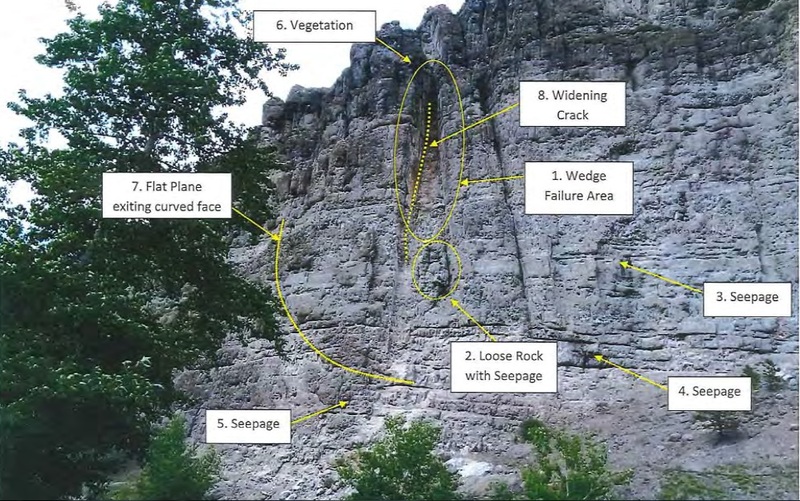 Outside of the immediate wedge failure area, other portions of the rock face appear to have a high risk of wedge failures in the future. Areas #9 and #10 have discontinuities that intersect to create a wedge. They appear to be relatively stable when compared to the loose rocks in area #2, but the risk of failure still exists. A large rock is defined by the discontinuity shown with lines labeled #7 and #8. These discontinuities represent failure planes, and although no active movement was observed, there is a risk of future failure. The question of risk should be a key area of discussion at the meeting. The most dangerous part has loose rock, which can be mitigated by rock scaling to remove the loose rock. A flexible rockfall barrier is recommended for the remaining 1/4 mile. GSI indicates they can be on site within three weeks of signing a contract, and would do the work in one continuous effort. Scaling would take approximately 15 days. GSI suggests the placement of the flexible rockfall barrier could be deferred until a later time, which would reduce the cost of the work by a million dollars. As I understand this, that means that, once the County contracts with these companies, it would take three weeks to get to work, and another few weeks to do the work. The total short-term cost would be about $500,000. This is just an overview. I recommend that you read the documents before the meeting. There is much to discuss. This entry was posted in Community Organization, Politics and History and tagged Stillwater County Commissioners, Stillwater River Road. Bookmark the permalink.